This award is given for outstanding contribution and recognition of long service as a volunteer at national and/or County level. 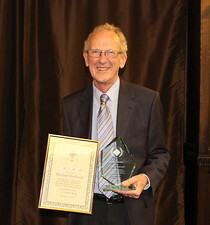 Steve was presented with this award for his long service to Regulation and Laws & Ethics. Richard has served on numerous committees throughout his bridge administration 'career'. He has sat on the EBU Selection Committee from 1982 to 2006 (with only one year off in the mid-1990s), five of those year's as Chairman. He has also served on the Laws & Ethics Committee for a total of 14 years from 1981 up to and including the current committee. He has also served on the EBU Constitutional Commission and was a member of the Conventions Working Party. 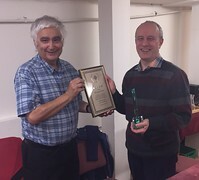 In addition to his work with the EBU, Richard has served on the committee of the London Metropolitan Bridge Association for 20 years, with ten of those as Chairman). In 2016 Richard wrote a comprehensive book, 'Tournament Bridge in England: 1925-1945', which he donated to the EBU. Mike's major national, and international, contribution has been through the software he has developed. His Bridge Timer – which he made available to the EBU at no charge, and is very highly regarded - is used at all EBU events, and at many other events round the country and beyond. His Hand Generator software, which he kindly donated to EBED for use in its online Teachers' Zone, makes it easy to generate hands and insert them in to documents, or to create documents from existing deal files. This provides an excellent resource for producing commentaries, lessons, and other handouts. He also created, and made available, his Bridge Scorer software. Mike has been a member of many committees at local and County level. He has been a ‘core’ member of the Westmorland County Bridge Association for several years in the role of Secretary. He has organised the very popular County Swiss Congress. He has also set up and run the ‘CancerCare Bridge Tournament’ which since 1994 has raised over £59,000. He is one of the key trainers of Club TDs, running a number of EBED courses in the North West. 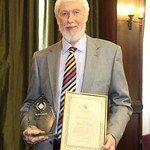 Roger has been a Norfolk CBA committee member since 1970. A member & chairman of the Norfolk Tournament sub-committee and Congress sub-committee since 1996. NCBA Vice Chairman 1979-1980 & Chairman 1980-81 and again 1993-1996, and President 1998-99. NCBA Competitions Secretary 1980-1985 and Eastern Counties League Organiser 1988-2015. Roger has been Match Manager of two Corn Cairdis events. Jointly organised the Norfolk/Suffolk Green Pointed weekends 1992-2012 and organised Tournament Director training 1990-2014. He was a member of the EBU Board of Directors 2002-2003, a member of the EBU Selection Committee 2003-2006, and was an EBU County Representative 1982-1985 and again 1993-2015. Roger continues to serve the County and offer help wherever he can. Mike was one of the main figures behind the set up of the National Grading Scheme (NGS). He was the project leader and a main figure on the working group of the time. He has maintained and developed it since it was introduced in late 2011. Has been recommended by his county (Sussex). He is their current President and has been involved at committee level for many years. Martin is a current member and past Chairman of the EBU Laws & Ethics Committee. He was elected to the EBU Board in 2005 and served for 5 years until 2010. He was the EBU consultant on Club and county constitutions for a number of years. He has conducted a number of prosecutions in disciplinary cases on behalf of the EBU. Philip is President of Yorkshire having been its very successful chairman for 25 years until earlier this year. He is a member of the EBU tournament committee and served with distinction as its chairman for some years. He was an EBU board member and became its vice chairman. He was also the board’s representative to Bridge Great Britain. There is no sphere of bridge administration with which Philip has not been involved, at county or national level for a period of over thirty years. 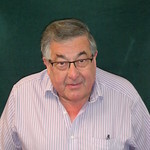 Brian joined the Kent committee in 1983, and became Secretary in 1986. He then became Chairman in 1989, a post in which he continued for four years until forced to stand down from the committee because of business commitments. He continued to arrange events for Kent including their first Green-Pointed event, and their first Stratified Swiss Teams (indeed, the first such event in the country). Brian returned to the Kent committee in 2002 as Secretary, and served for another seven years. Throughout this time he has been active at his local club, serving on committees. A shareholder since 2002, he served for seven years on the Tournament Committee, six of those as Vice-Chairman, providing invaluable support for two successive Chairmen. Among his achievements were the introduction of Blue Points, and his interest in the field of Master Points was of great importance at both national and county level. There is no sphere of bridge administration with which Brian has not been involved, at local, county or national level for a period of over thirty-years. Mike has been involved in Bridge Administration for thirty years. His contribution at club level (BP; London Business Houses) has been considerable. 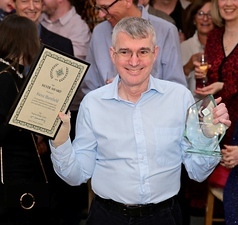 At county level he has edited the London newsletter and served as Chairman not once, but twice, the second time filling the post when nobody else was prepared to. His work behind the scenes in the county was second to none, but in 2006 he made his mark on the national scene. He was co-opted onto the board “in training” in 2006 because the post of Treasurer was to become vacant. After a year he took the role on, and there followed the most difficult and complex financial period in the EBU’s history, as Universal Membership was introduced. His diligence and guidance ensured that the transition period ran smoothly, and his support was invaluable. During his time on the EBU Board, Graham acted as an important influence. His positive and forward-thinking outlook was always centred on the players. His record at local and county level confirms this, and without his contribution bridge in Sheffield, Yorkshire and the North would have been all the poorer. He has been Vice-Chairman of the Yorkshire Board of Management since 2001, and on the Board for almost twenty years before that. His inception of the Northern Bridge League, and the National Final for the five Inter-Counties Leagues were successes, and with his steadfast wife Pat beside him he has been running the Yorkshire Congress for the last three years, amongst many other activities. His encouragement of new players is well-known, and everything that he does, including, in 1984, starting up a new club, has been geared up to making sure that the game continues, recognising that without incomers, there is no future. Renowned not just as a player of some quality and a dedicated administrator, Graham enjoys the highest reputation at the table as a gentleman, and a pleasure to play against. Christine is currently London County Secretary, County Youth Officer and Editor of the LMBA Newsletter. She is one of London’s EBU Shareholders. Competition organiser for many competitions over the years, including organising the Lederer and the Channel Trophy. She is also Secretary of the Young Chelsea BC, having previously been Chairman. Been on the YC Committee since 1970’s. Joined YC Management Committee at its inception in January 2005 as Club Secretary and Teaching Co-ordinator. Organiser of YC duplicate sessions for developing players and YC schools bridge events. Christine was Secretary of Civil Service CBA for much of the 1970’s and ran their London League and national congresses. She became a director of Better Bridge in Britain in the 1980’s. Organised their first “No Fear” events and Charity Challenge Sim Pairs for many years. She also became a Youth and Education Trust trustee in 2009. Christine has, and continues to have, considerable influence over the playing and development of bridge at club and county level and has given up so much of her time for so long for the service of bridge in this country. 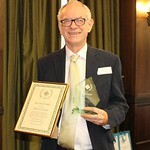 Cecil Leighton has been nominated by London Metropolitan Bridge Association in recognition of his truly exceptional services to the County and to bridge. Cecil served on the LMBA Committee in a number of different capacities, including a period as Chairman, for some 54 years until his retirement at the LMBA AGM this summer. This length of service deserves very special recognition in itself, but it is worth emphasising that he has been a very hard and active worker on behalf of bridge in the capital during all that time. Cecil was awarded a Dimmie Fleming Award some time ago, in 1992, and London understands that this silver award would now be the most appropriate way of showing the appreciation of the bridge world for all his efforts.